Today I’m excited to introduce a guest post written by Sarah of Stationery Magpie. 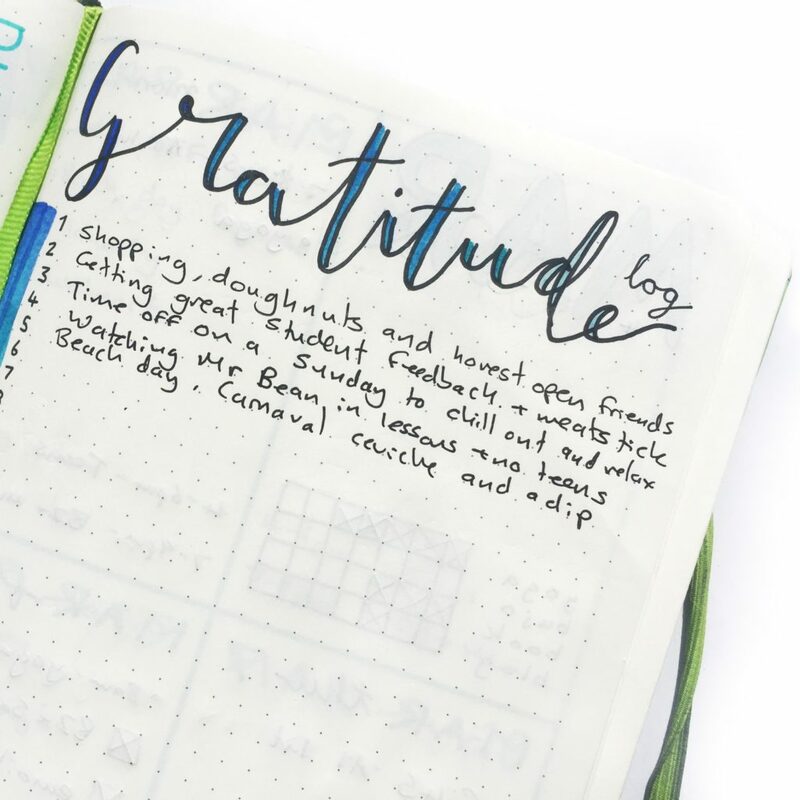 Her post has inspired me to introduce a gratitude log into my bullet journal for April, and I hope it does the same for you! Bullet journaling is a great way for us to stay in touch with not only our everyday tasks but our thoughts feelings and emotions. If you’re not using your journal to track how you feel yet then you’re missing a big trick. You might think it’s cheesy like I did in the beginning but once I started including it in my journal I realised that it was far from it. 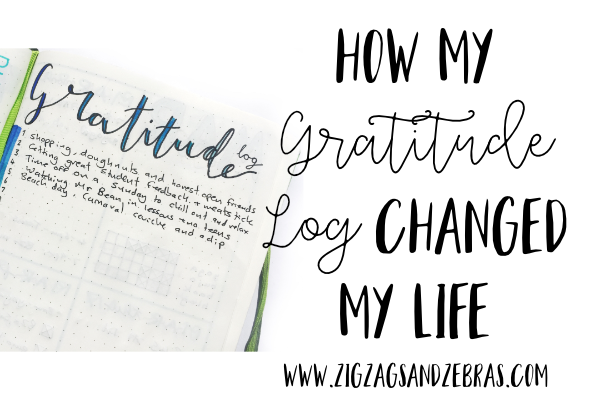 In this blog post I’m going to talk all about gratitude logs and why you should take the plunge and include one in your bullet journal. A gratitude log is simply a list where you write down at least one thing you’re thankful for every day. It can be something tiny like a nice cup of tea or spending time cuddling your cat or it can be something big like getting married or meeting the love of your life. But why would you do that? What benefit does it hold for you to include it in your bullet journal? Well I’m going to show you why my gratitude log fast became one of my favourite pages in my bullet journal that I include every single month in my set up. What I love about my gratitude log is that it’s just so simple and easy. 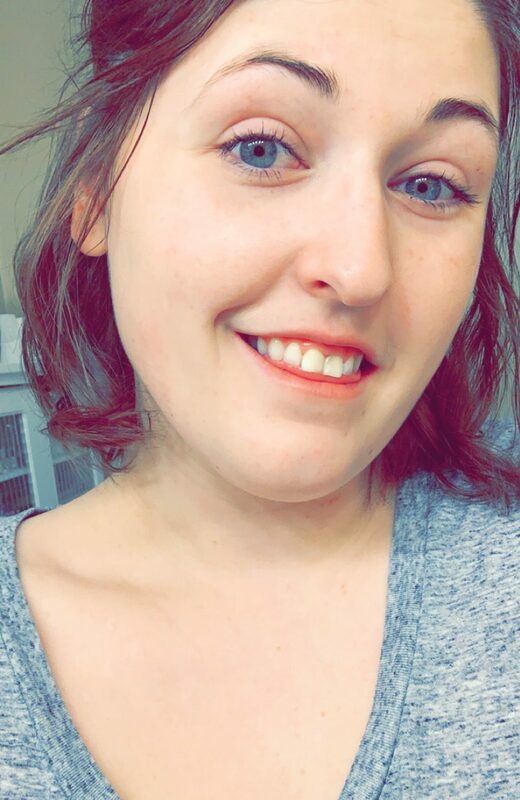 I don’t have to put a lot of time or effort into it. If I want to I can make it more complicated by incorporating it into a drawing or adding lots of doodles and decoration but the point is that it’s a place where I can quickly jot down the best part of my day. I don’t need to spend any longer than a few minutes reflecting on my day to figure out what I’m going to put down. It’s fast and easy which means I’m a lot more likely to actually do it rather than write a whole journal entry every day! 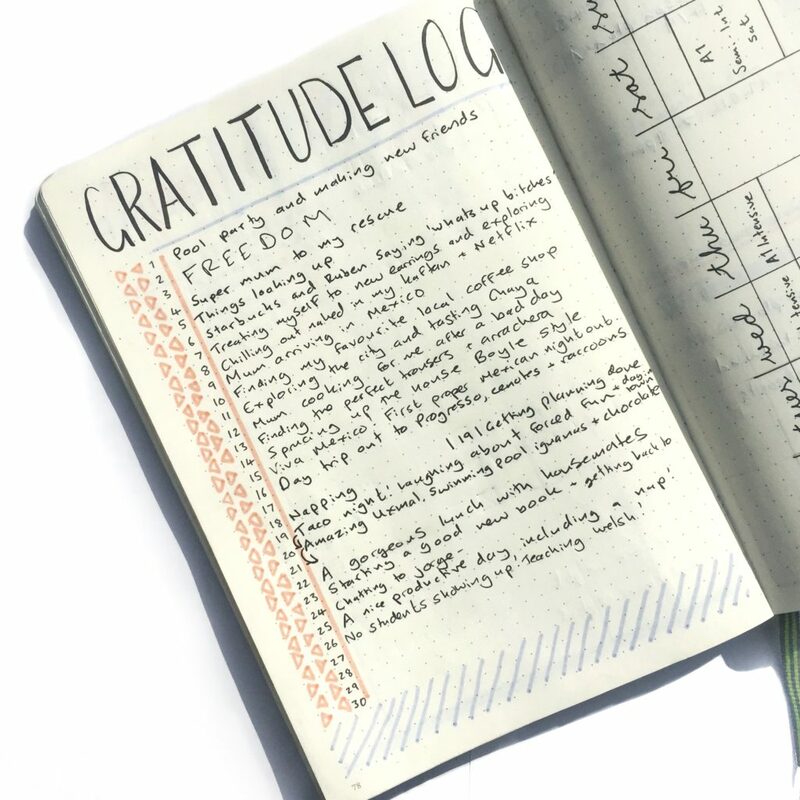 One great by product of keeping a gratitude log is that it’s almost like a ‘one line a day’ style journal that’s incorporated into your bullet journal. I love the idea of the one line a day journals but personally I don’t think I’d carry around a separate notebook just for that, so having it in my bullet journal is ideal. One surprising by product of my gratitude log is that it’s helping me to remember more of the precious moments of my life. Looking back at my log it might say something like ‘a stroll and an ice cream with my best friend’. Without having my gratitude log I might never have remembered that lovely afternoon but now I can look back on that wonderful memory and cherish it again. Let’s face it, not every day is going to be groundbreaking and amazing but there will usually be something good in every day even if that good thing is that the day will end! But a gratitude log takes account of all good things. Some days nothing much has really happened but I had a really nice coffee or I really enjoyed my lunch. Maybe I took time to relax and look after myself or maybe I was really busy but it made me feel good to be productive. Sometimes my gratitude log literally just reads ‘a quiet night in’, great, I must have really needed it! Some days I really do feel like everything is against me. Often it isn’t but we can’t be happy all the time. So is having to write something down in a gratitude log going to make me feel better? Maybe not but if I know that I’m going to have to write something down maybe it will inspire me to do something nice for myself so that I have something to write down. Random acts of kindness are important especially to ourselves. The idea of a gratitude log is to complete it every day. Of course sometimes you might find it hard to think of something but even so you can put something down. I feel like my gratitude log encourages me to open my bullet journal and use it. It’s such a low commitment page that once you’ve written something down I often find I’m inspired to do a little bit more in my journal. It’s one of the easiest things to keep up with and even if I don’t I can often remember something to write down the past few days and that helps me to reflect on what’s happened in my life with a little more distance and a different appreciation. To sum up, my gratitude log is the one ‘extra’ page I make sure I include every single month precisely because I feel it has so many benefits both short and long term for my well being, memory and my commitment to my journal. 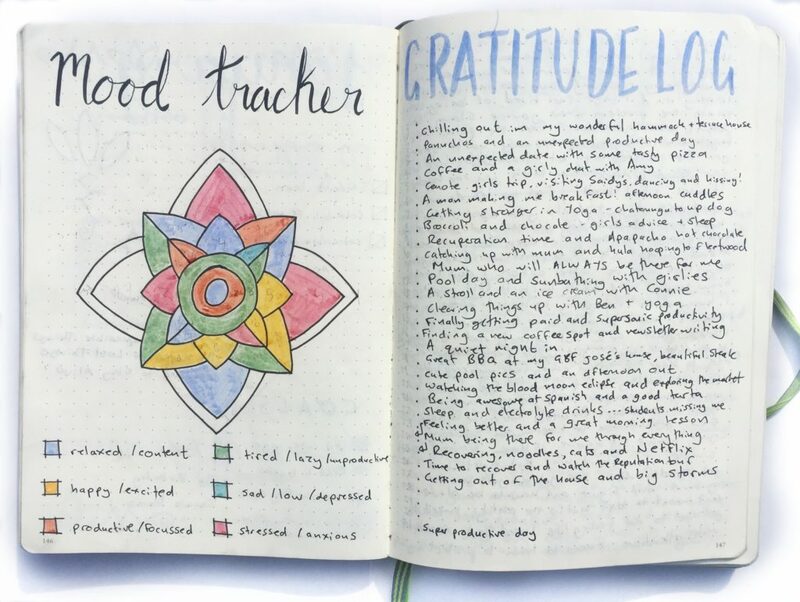 Do you use a gratitude log in your bullet journal? How has it helped you? Sarah is a British stationery and journaling blogger. She runs the website stationerymagpie.com. 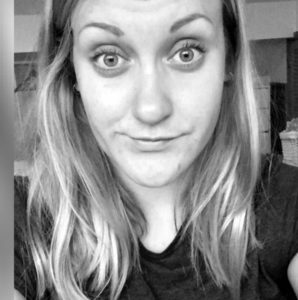 Her day job is teaching English and she currently lives in sunny Mexico. You can follow her on Instagram or sign up to her newsletter to get information about new blog posts, giveaways and offers in the stationery market.